Things We Love About Italy! Both Sessions Filled: SDSU Summer 2019! This 3-unit, Faculty-Led Study Abroad program meets the College of Health and Human Services undergraduate international experience requirement. Non-SDSU students are welcome to enroll at no additional fee regardless of state residence. International students are welcome as well with no additional fee. Faculty are invited to participate with their students! 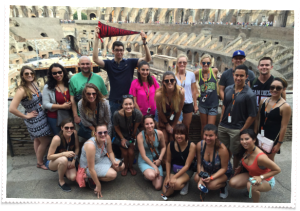 Students explore the cultural heritage of anatomy education by traveling to Italy where this modern science began. Students visit museums in Europe’s oldest universities in Rome, Florence, Bologna and Padua, to see historic dissection theaters and centuries old anatomic wax sculptures. Also visited are the Vatican Museums, Borghese Gallery, and Uffizi Gallery. Email Kevin Petti, Ph.D. with questions. Programs often fill in 24 hours, so be sure to register immediately. Follow Anatomia Italiana programs on Twitter, Facebook, and Instagram to share the excitement. Consider joining us in Summer 2018! Dr. Petti to Introduce Italian Research Day at the IIC in Los Angeles! Registration CLOSED for London~Netherlands~Paris in Summer 2019! Copyright © 2019 Anatomia Italiana . All Rights Reserved.